This is a shot that I managed to get on a recent trip down to Busselton. The farmers had been burning off the whole time I’d been down there and the smoke was ensuring that the sunsets were staying around for ages (at least 20mins) and were a really deep red. Its a pleasure taking landscapes like this when the sunset hangs around for ever instead of the usual two second sunsets that we get here in Perth, Australia. Normally as any other West Australian landscape photographer will tell you, we get about 5 maybe 10mins max to capture a sunset so if you ever see someone tearing up and down a beach clambering over sand dunes and rocks and doing crazy things chances are its one of us taking photos. I know that Dylan Fox and Clint Baker were down there at the same time and I’m sure we’ll be seeing some more awesome photos from those guys shortly. I think with light like I had down at Busselton / Dunsborough / Margaret River during that week Clint’s Curse is finally broken. So has anyone else been caputring any good photos? They don’t even have to be landscapes. Anyone want to place a bet on how long Clint gets to stay in Greece before we see in the Greek news “Australian Landscape Photographer deported for bad light” lol. 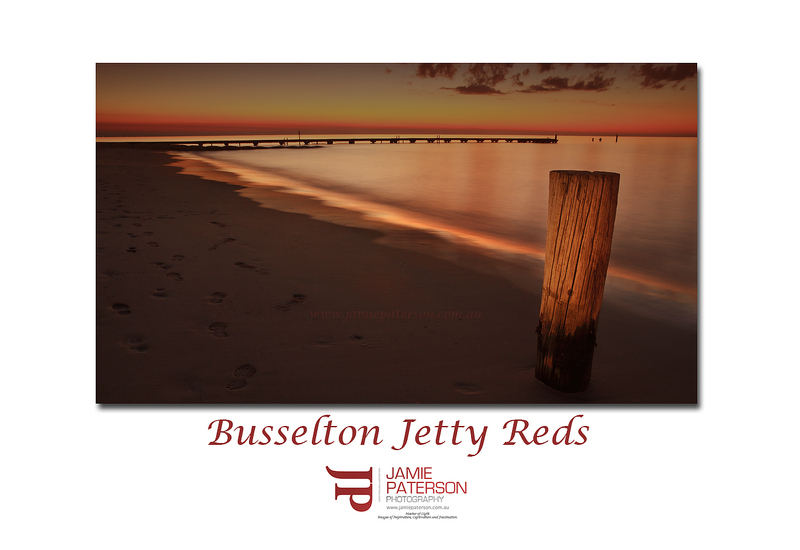 This entry was posted in Australian Landscapes, Beach Photos, Perth Photos, Sunset Photos and tagged australia, beach, Busselton, canon, canon 1ds mkIII, dunsborough, image, Jamie Paterson, jetty, landscape, long exposure, margaret river, ocean, reflections, seascape, south west, southwest, sunset, surf, waves, western australia, yallingup. Wheres all the Esperance shots? Thanks for that. The Esperance photos I will continue to release fairly slowly as I won’t be heading back down there anytime soon, also a lot of them are stiched and we all know that those babies take time to work on. I’ve just finished reading a great book on the Canning Stock Route that you may very well love to read. It was an autobiography on Canning’s second in charge. Jamie, what a nice blog you have. Thanks for letting me explore it. Red sure is right… that’s very red! Thanks for stopping by and commenting. Your blog has some great work as well. The colours just hung around for ages it was amazing and enjoyable. As I mentioned its more fun than work when you see a landscape like that before your eyes. Did you go down to the beach on Sunday at all? I heard from one of my surfer mates that the surf was still huge for Perth that is and very clean. Would’ve got some good photos if you did. He was surfing down at Scarborough which isn’t normally as big as Trigg. I appreciate your kind words. Your blog has some fantastic work on it as well. Thanks for the coment. Much appreciated!! !